Ornamental Containment, a series of new monotypes by Deborah Pinter, is showcased in the spotlight gallery beginning Friday, September 15. 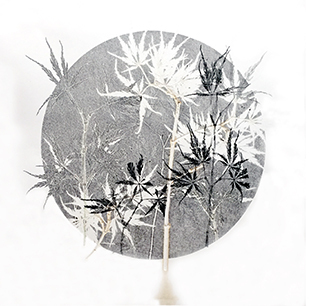 Employing the compositional restraints of a circular format on square paper, Deborah continues her exploration of directly creating prints from natural elements such as leaves, branches and stones, which are added in layers to create a positive/negative rhythm. Join us for a community opening reception on Friday, September 15, meet Deborah, and learn more about her work. Deborah Pinter’s work is shown in cooperation with Dolan/Maxwell Gallery. Spotlight Gallery solo exhibitions are devoted to supporting Heights Arts working artist-members. Working Artist Membership programs are generously supported by the Cyrus Eaton Foundation.